Survey and Mapping Office (SMO) of Lands Department has applied new technology to improve the quality of services in recent years. It makes use of the Global Navigation Satellite System (GNSS) to develop a local satellite positioning system, named as "Hong Kong Satellite Positioning Reference Station Network" (SatRef). 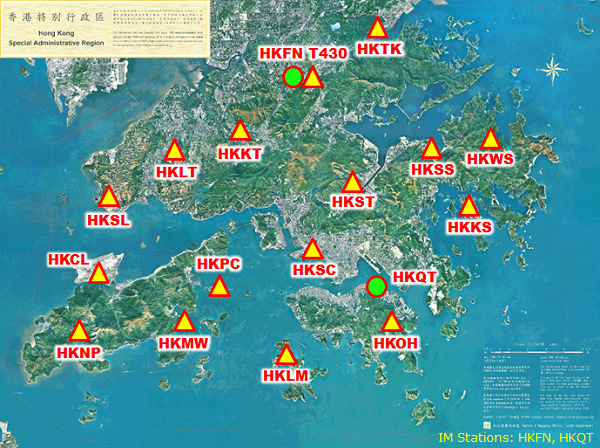 The network consists of 18 Continuously Operating Reference Stations (CORS) including 16 reference stations and 2 Integrity Monitoring stations evenly distributed in Hong Kong. The stations receive GNSS satellite data round-the-clock and send it to a Data Centre for further processing and analysis. The products are disseminated to users for high accuracy positioning works. On the other hand, there is a Control Centre which is used to remotely control the servers in the Data Centre. The whole SatRef system would be monitored in the Control Centre to ensure the services would not be interrupted. The SatRef Reference Stations established an accurately surveyed control network to realize the local reference frame. The network provides a linkage between the local reference system and global reference system. Spatial information can be effectively exchanged on the same spatial language. For positioning user, the SatRef services provide significant improvements on accuracy, efficiency and productivity; meanwhile, the cost of operation is reduced. The continuous operation of the system has sufficient risk mitigation measures. The SatRef development has stimulated the establishment of new survey standards for applications. It facilitates the exploration of the full potential of the Positioning Infrastructure. It opens up new business opportunities for innovative applications, and facilitates market participation to provide value-added products and services for the economic benefit of Hong Kong. The Hong Kong Satellite Positioning Reference Station Data Services was launched on 4 February, 2010. Please click here for more information.